WJBC and Direct Travel have joined together to bring you a once in lifetime opportunity. 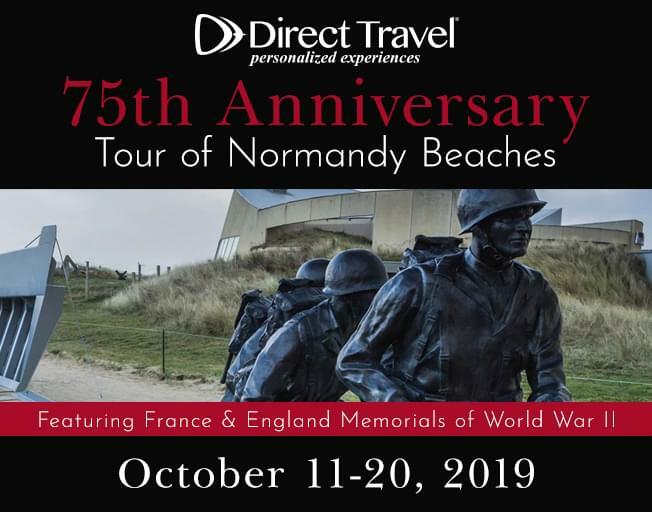 History comes alive on this nostalgic, emotional and powerful tour of England & France including the Normandy Beaches. This tour costs $4,999.00 (per person based on double occupancy). Travel from the US to London for city tours, WWII themed tours, cultural experiences, and more. Then hop the channel on the Eurostar Train and onward to Caen with stops along the way. From there you’ll take excursions to the landing beaches, memorials, and cemeteries. After a stop in Compiegne for another memorial and a Champagne experience you’ll head to Reims for more incredible history. After staying in Reims you’ll head to the “City of Lights,” Paris for history, sightseeing, and a farewell dinner on the first floor of the Eiffel Tower.